QuarkXPress had its time at the very top of the publishing tree. It led the DTP revolution in the late 80s and continued to dominate the professional publishing space until – most would say – Adobe released Creative Suite in 2002. Then the creative world suddenly got a tool called InDesign bundled with their copies of Photoshop and Illustrator. 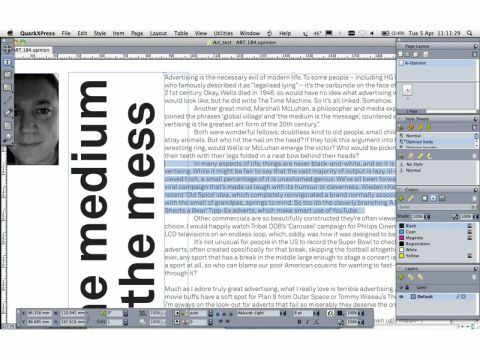 While this isn't the place for an XPress/InDesign debate, Adobe's tool has been widely adopted by mainstream publishers, leaving XPress in a somewhat tricky situation. But recent releases of XPress have redressed the balance in terms of features, even if it is perhaps a little too late to win back the CS-converted. So, what can XPress 9 do for publishers? The biggest addition is certainly App Studio for QuarkXPress, enabling you to create iPad e-zines and other apps. It also has a Mobile App Interactivity palette enabling you to add slideshows, buttons, sound and HTML to your XPress docs. It uses the online App Studio portal to publish and manage your app (though you'll require the Apple dev account and Quark's issue management service, which will cost extra). But unfortunately, the App Studio doesn't arrive until 90 days after XPress 9 ships, so as yet we haven't been able to test it at all. Still, this is obviously a huge step forward for Quark, and its digital intent is further solidified by support for Blio eBooks. Essentially, you can export your QXPress project directly to an XPS file. The tool is simple to use, with the Blio Interactivity dialog being accessed through the Digital Publishing Command-click menu. But does anyone actually use Blio? Certainly not on the Mac, as it's currently only available for Windows; we await a Mac release. You can also export to ePUB, using the Reflow view to assemble and preview a reflowable version of your layout. And of course there's all the web stuff from version 8. These tools certainly aren't second-nature to traditional print designers, but are easy to get to grips with. Conditional Styles enable you to intelligently combine several rules in one style (such as making the first word in a paragraph italic and the next three words bold and a different font, for instance). It's essentially Nested Styles, as seen in InDesign. It's a more than welcome catch-up and the palette is nice and simple to use. Bullet and numbering styles go a long way to speeding up layout jobs. Callouts are also new, enabling you to anchor boxes and groups to a particular point in your text. And now for a feature we really love – ShapeMaker. So simple yet so intuitive, with real pulling power for those without Illustrator, ShapeMaker lives up to its name, enabling you to create complex shapes with a unique slider-based interface. Wavy shapes, polygons, spirals and rounded rectangles can be created with ease, but the fun part is experimenting with the tools. Similarly, Cloner (enabling you to copy selected items to the same place on different pages or projects) and Linkster (to quickly link and unlink text boxes without overmatter) are very smart additions. XPress 9 retains its easy-to-use interface and project-based workflow. It's intelligent, fast on low-spec Macs, and a powerful publishing tool for all mediums. But it's still suffering the effects of Adobe's market dominance, so it's going to take a lot more than a great release to pull things back. But for XPress fans, this is a remarkably good version – and if the App Studio impresses, it's verging on superb.